I was reading through some threads the other day and kind of got lost in them for awhile. Now I can't recall where I read this, but saw that folks in the Netherlands are considered to have vastly superior practices with regard to weaning baby birds than, say, Americans and their force-weaning practices (in some cases). It was a blurb within a comment on a post, and as I glossed over the thread, I thought, "Wow, that's really interesting; I'd like to learn more!" So, what can y'all tell me about that? Why are they better at weaning babies than we are? What is the difference in how they do it, and how do those differences impact the health of the babies? Please do share all you can with me. Links to articles are a huge plus! I also read somewhere on Facebook recently that wing-clipping is heavily frowned upon these days. I just want to say that when I was working in a pet shop for birds, we did many many many wing trimmings (and nail clippings) each day and no one batted an eye. I'd love to hear why the change in popular opinion and how it affects the mental well-being of the bird(s) who go unclipped. I, myself, have fully flighted Lovebirds because, personally, I think it's better for the bird if they can fly around. That's the most basic reasoning I have for it. I'm sure there are much more deeply rooted thought processes for leaving birds flighted, and those are the ones I'd like to hear. I want to know why YOU leave your bird flighted, and also how you handle the bird(s) when in flight. These two subjects are on my mind, and I'd love to learn more! Please feel free to share opinions, but especially fact-based information pertaining to them. Thank you! Weaning babies need to fledge first, and become accomplished fliers , then if you must you can decide on wing trims. The fledging is a monumental milestone in their development, their breast muscles develope, their wings finish growing correctly with the flight feathers guiding them, their brains finish development . They have confidence. Birds that never learn to fly, startle easy, lack confidence, some like mine won't even hop to perch that is like an inch away. They are more prone to feather destructive problems as adults. Adults that are kept flighted have much better health, less likely to become overweight, burn up some of their energy flying around, so less frustrated I think, it allows these intelligent birds to make more personal choices, instead if us dictating their every move. I believe Sailboat thread on Amazon's has a scientific section on the benefits of flight, that an author allowed him to quote, his whole thread is worth reading, it's a sticky in the Amazon section. Thank you, Laurasea! That was helpful! I'm going to look for the sticky thread on weaning right now. I agree with the above. Babies must fledge and learn how to fly skillfully before you ever consider clipping their wings. Clipping a weaning baby runs the risk of them never learning how to fly properly, even when their flight feathers grow in. Force-weaning is a terrible practice and can lead to neurological defects as the baby gets older. Last edited by FlyBirdiesFly; 11-30-2018 at 06:17 PM. 6 months - 1 year before you clip them the first time. I read a study a long time ago on it and can never find it again. Maybe it’s what was referenced before. I found it when doing research for my baby Cockatiels 8 yrs ago( ). The conclusion was that flight is learned when young (just like young kids absorb things like a sponge) and for development of the chest muscles and such. Just for reference my Cockatiels were allowed flight for a year before being clipped. They are very very good fliers. My green cheeks are very good fliers too but they learned most of it later in life (I mean if 1-2 yrs old is later in life) from watching the tiels. The green cheeks are actually more dare devil like than the tiels now. Last edited by riddick07; 11-30-2018 at 06:22 PM. My Neptune was clipped by breeder before fledging and before done growing, now that the feathers have come in his wings cross weird and the flight feathers rub, I believe that the flight feathers guide and help finish normal wing growth, and the muscles that hold the wing. 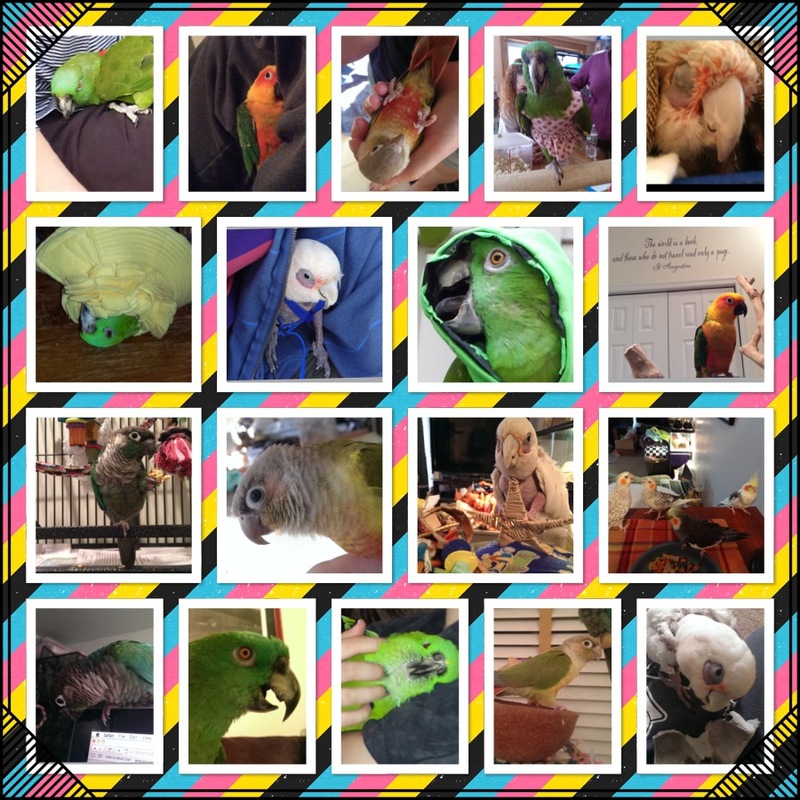 I raised Indian Ringnecks and I used to raise green cheeked conures; two species famous for biting. Funny how I never once have ended up with a bird you could reasonable call “a biter”... so what do I do differently? -FULL FLEDGING! Doesn’t mean you never clip, but that the mind and body are allowed to grow to adulthood with the power of flight, as it was intended. -ABUNDANCE WEANING! The baby will stop taking formula when he is ready; taking it away before that is cruel and damages the mental and emotional stability of the bird. -HEAVY SOCIALIZATION which means introductions to as many situations as possible, not just lots of people. I haven’t read the article you speak of, but I want to! I don't like to think about where I would be if that little budgie had never fluttered into my life. Hi there, the Netherlands here (well only one of the 17+ million/ might be more by now, I do not keep count/ peeps there anyway). Silversage kind of already said it. A bird has 2 ways of dealing with danger: run away or attack. With wingclipping you take away the "retreat and regroup" option, so you are left with a bitey bird! Anyway- we have this wave of interest in animal-wellness (physically and emotionally/mentally) and it dawned on several people that since "handraised" birds are NINE TIMES MORE likely to pluck, automutilate, show severly disturbed behaviour patterns etc. than birds that were allowed to normally fledge / "parentraised" that there might be a correlation between those two. The cats got there first- after a lot of experimenting they found that most kittens actually need mums (sometimes) rough parenting to become 'civilised members of society' and selling them too young resulted in agressive, disturbed cats. The same with babybirds who must learn "how to parrot propperly" from interacting with the parents, the siblings (and at some stage the humans they will be living with). Anyway- after a lot of debating and compromising (because almost everybody wants a nice cuddly, dependend babybird <as much as people want kittens en puppies, not grown ups> and the longer you keep a baby- the less profitable it will become, and you DO want to get and keep(!) the breeders on board with this of course, they decided to let at least keep the babies with the parents till they could more or less eat by themselves. so they had this list ... and it became the law (in 2014). No more nestrobbing or selling them on too early. Maybe One day I'll translate all of them and make it a sticky, if people are interested.